The project consisted of reorganizing and remodeling an original 1910 Carnegie Library and it's 1984 addition. The design team introduced a new entry and commons space providing much-needed spatial relief and allowing reorganization of existing spaces within the library. The dramatic expansion provides a new civic beacon along Division Street, Northfield's historic main thoroughfare, and serves to articulate and frame the original historic structure that had been blurred by the matching 1984 addition. Creating a light, open addition more appropriate for a state-of-the-art library beautifully re-frames and honors this important institution created more than a century ago by Andrew Carnegie and the City of Northfield. An expanded children’s area, greater digital access, and more flexible space will serve this community well into the new century. Surrounded by a two-story glass facade, the community room is anchored by a grand stair and an efficient service desk. The contrast between old and new grounds and elevates both. 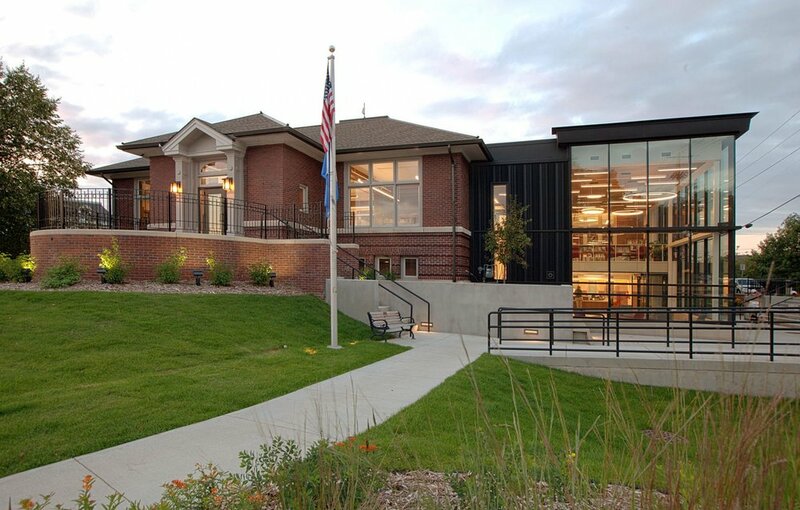 Over half of the funding for the project was raised by citizens of Northfield, over 90% of whom are library card holders. Andrew Carnegie funded the building of 2,509 libraries across the world. You could read about him on Wikipedia, but of course you should probably check out a real book from one of his libraries. For upcoming events check out (see what we did there?) the historic Northfield Public Library on Facebook. Need to read us in on a project?